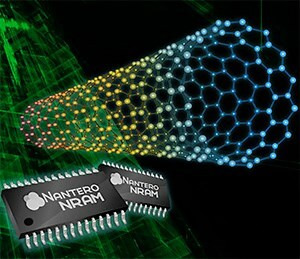 We've been hearing about Nantero's NRAM since like forever! Looking in the DV Hardware archive, the first post we wrote about this technology dates back to 2005, which is ancient history in the tech world. The latest news is that the company did another round of investment, and received support from several high-profile tech names. The first NRAM products may arrive as early as 2019, more info can be read at EE Times. Nantero Inc. has received investment from eight strategic investors, five of which were participants in its most recent strategic round for a total of $29.7 million. They include Dell Technologies Capital, Cisco Investments, Kingston Technology Corporation, and CFT Capital, one of China's leading semiconductor investment firms incorporated by SMIC, mainland China's most advanced pure-play semiconductor foundry. "If you look at the investors, several of them are among the 10 largest buyers of ICs and memory in the world," Nantero co-founder and CEO Greg Schmergel told EE Times in a telephone interview. "It speaks to the level of support from customers that are not niche players, but are mass-market leading players."